If you’re feeling down about your chipped or damaged teeth, ToothKind can repair and restore your smile in no time. At ToothKind, we understand that an unsightly or damaged tooth can have a negative impact on your self-confidence. A crown or bridge may be the solution if your teeth are cracked, damaged or badly decayed. Toothkind offers the latest digital CAD/CAM technology to create beautiful, long lasting crowns while you wait. This often means no more temporary crowns as the whole procedure can be completed in one visit. Your Toothkind dentist can discuss the best options for you. A bridge allows the dentist to replace lost teeth with new artificial teeth, without the use of a dental implant or denture. Basically a false tooth is attached to the tooth next to it to hold it in place. 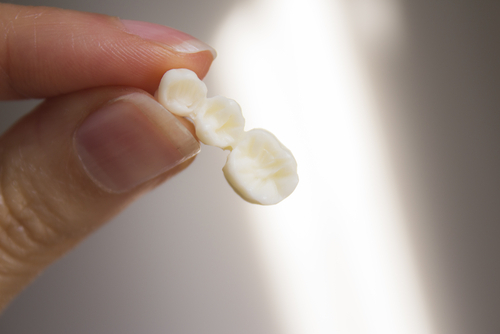 As the name suggests, a crown is a cap or covering for a tooth. It is used when your tooth is discoloured, cracked or broken, heavily filled or if fillings have been lost. There are several types of dental crowns available so your ToothKind dentist will advise the best option depending on the location of the crown. They may recommend ceramic, resin or sometimes even gold crowns. Our dentists use their expertise and modern technology to precisely match the new crown to the shape and colour of your existing teeth. Some of our dentists offer same day crowns using CAD/CAM technology to design, produce and insert ceramic restorations all in one single appointment. If your teeth are heavily filled, they may be at risk of fractures. 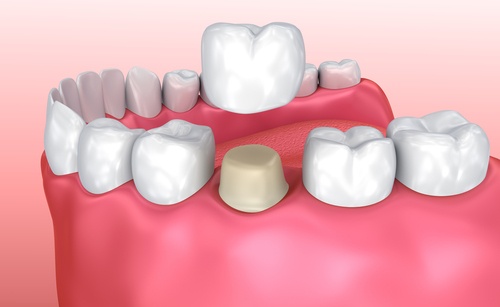 Frequent replacement of fillings can lead to loss of precious tooth structure. Repeated dental treatment on the same tooth may lead to deepening of the filling and subsequent nerve inflammation. To avoid these complications, your dentist may recommend that a crown is constructed before the filling becomes too large and remaining tooth structure is too short to support a crown. Root canal filled teeth are prone to fractures, due to the nature of root canal treatment and hollowing out of the tooth in the process. Dentists highly recommend crowning root canal filled teeth to protect them from fractures and further bacterial infections. To make an appointment to discuss crowns or bridges, get in touch today.